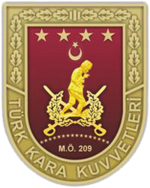 The Turkish Land Forces (Turkish: Türk Kara Kuvvetleri), or Turkish Army (Turkish: Türk Ordusu), is the main branch of the Turkish Armed Forces responsible for land-based military operations. Official sources trace the army's foundation to Modu Chanyu of the Xiongnu Empire in 209 BC, but the modern history of the army began with its formation after the collapse of the Ottoman Empire. Significant events since the foundation of the army include combat in the Korean War and in the 1974 Turkish invasion of Cyprus, and acting as a NATO bulwark along Cold War frontiers through 1992. The army holds the preeminent place within the armed forces. It is customary for the Chief of the General Staff of the Republic of Turkey to have been the Commander of the Turkish Land Forces prior to his appointment as Turkey's senior ranking officer. Alongside the other two armed services, the Turkish Army has frequently intervened in Turkish politics, which has now been regulated to an extent with the reform of the National Security Council. The current commander of the Turkish Land Forces is General Yaşar Güler. In 2010 the International Institute for Strategic Studies estimated that the Turkish Army had an established strength of approximately 402,000 active personnel, consisting of 77,000 professionals and 325,000 conscripts. A more recent estimate (2012) put the figure at 391,000. However, In October 2014 the Turkish Land Forces had a strength of 350,000 personnel according to TLF's declaration. As of late 2015, reports suggest the Turkish Army (along with the rest of the Armed Forces) have seen their personnel strengths increase to similar levels of the 2000s. Factors contributing to this are further destabilization of Syria and Iraq due to ISIS and the Russian intervention in Syria, as-well as the re-emergence of a PKK insurgency in Turkey's south east. The modern Turkish Army has its foundations in nine remnant Ottoman Army corps[a] after the Armistice of Mudros at the end of World War I. After the rise of Turkish resistances (Kuva-yi Milliye) in Anatolia, Mustafa Kemal Pasha and his colleagues formed the Grand National Assembly (GNA) in Ankara on April 23, 1920, Kâzım Pasha's XV Corps was the only corps which at that time had any combat value. On November 8, 1920, the GNA decided to establish a standing army (Düzenli ordu) instead of irregular troops (Kuva-yi Milliye, Çerkes Ethem's Kuva-yi Seyyare etc.). In 1964, tr:Kemalettin Eken was promoted to the rank of Major General. He then held command of the 57th Training Division in Manisa, between the years 1965 to 1967. He later commanded 7th and 9th Corps. The Turkish Army has since the mid-1960s operated on a corps-division-brigade system, with a varying number of divisions and brigades assigned to a corps. The IISS Military Balance 1966–67 recorded a total strength of 360,000, with 16 infantry divisions (14 NATO assigned), 4 armoured brigades (Zırhlı tugay) with M47 Patton tanks, armoured cavalry regiments, and two parachute battalions. At some point in the 1960s the Army apparently utilised the Pentomic structure for a period, before adopting the American ROAD divisional organisation. Back in the early 1970s, there was a 6th Infantry Division based at Istanbul. The U.S. Area Handbook for the Republic of Turkey, written by Thomas Roberts, said in late 1968 that the army had 425,000 men (p. 385), three field armies (First: Istanbul, Second: Konya, Third: Erzurum), thirteen infantry divisions, one armoured division (with M-47s and M-48s), four armoured brigades (M47 Patton tanks), two armoured cavalry regiment, two mechanised infantry brigades, and two parachute battalions. There was a trained reserve of 450,000. 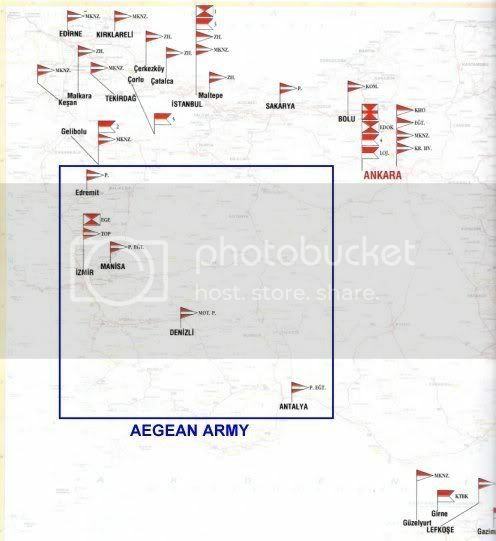 According to official British military reports in 1974, the Turkish Army included the First Army (2nd, 3rd, 5th, and 15th Corps), Second Army (4th, 6th, and 7th) and Third Army (8th, 9th and 11th Corps). There were also three Interior Zones with three recruit training divisions and four recruit training brigades. For a long period, these formations were grouped under the NATO headquarters Allied Land Forces South-Eastern Europe (LANDSOUTHEAST) in Izmir, led by a Turkish Army four-star General. In 1981–82, the Army had one armoured division, two mechanised infantry divisions, and fourteen Infantry Divisions, with 3000 M47 MBTs, 500 M48 MBTs, as well as 70 Leopard 1A3 on order, for a total of 3570 tanks. Until the dissolution of the Warsaw Pact in 1990, the Army had a static defense mission of countering any possible attack on Thrace by Soviet/Warsaw Pact forces, and deterring Greece, and any attack by the Soviet Transcaucasus Military District on the Caucasus frontier. The Third Army was responsible for holding the Caucasus line with about one third of the Army's total strength of one armoured, two mechanised, and fourteen infantry divisions (1986 data). Soviet forces immediately facing the Third Army in the Caucasus were the 31st Army Corps in the Georgian SSR and the 7th Guards Army in the Armenian SSR. Together the 31st Corps and 7th Guards Army had six divisions (roughly three Category "B" and three "C") plus some immobile fortified defence areas. Nigel Thomas's NATO Armies 1949–87, published in 1988, attributed the 2nd, 3rd Corps, 5th, and 15th Corps to the First Army; the 6th and 7th Corps to the Second Army, the 4th, 8th, and 9th Corps to the Third Army, and the 11th Corps to the Aegean Army. He wrote that the 11th Corps comprised the 28th and 39th Divisions. When the General Staff attempted to shift 120,000 troops to the frontier with Iraq in 1990, they discovered that there were serious deficiencies in the Army's ability to respond to crises that could erupt suddenly in distant regions. After the fall of the Soviet Union LANDSOUTHEAST in Izmir became Joint Command Southeast for a period, before becoming Allied Air Component Command Izmir in 2004. The headquarters' land-focused roots were revived in the 2010s when NATO's two air commands were reduced into one (at Ramstein, Germany) and Allied Land Command was established at the site. Turkey has signed an agreement with the US to buy fourteen CH-47F Chinook helicopters, for $400 million. Because of financial constraints, however, the Undersecretariat for the Defense Industry, or SSM, Turkey’s procurement agency, later wanted to buy only six CH-47Fs, five for the Army and one for the Special Forces, leaving a decision on the remaining eight platforms for the future. Contract negotiations between the SSM, the U.S. government and Boeing were launched last year. In 2017, Turkey has bought the anti-aircraft S-400 missile system from Russia. The TLF has seen frequent recent combat around and beyond its borders. It is fighting a conflict in south-eastern Turkey against the prolonged Kurdish PKK insurgency, and monitoring ISIS, Russian intervention in Syria, the Kurdish YPG, as-well as multiple other elements, in Syria. It maintained a prolonged command of Regional Command Capital in ISAF. Thus the TLF has had extensive combat experience. The structure of the Turkish Army has historically had two facets: operational and administrative. The operational chain consists of the field fighting formations, and the administrative the arms and service branches – infantry, armour, artillery etc. From 1992 the Army began to change from a corps-division-regiment structure to a corps-brigade arrangement, with divisions remaining on Cyprus and for certain special other cases, such as for NATO's reaction forces. In accordance with NATO’s new strategy in the early 1990s, Turkey agreed to commit forces to NATO’s ACE Rapid Reaction Corps. 'Therefore, the decision was made to create a new division. Thus, the old 1 Inf Div which had been abolished many years ago was reactivated and renamed as 1 TU Mech Inf Div and attached to 4 TU Corps on 30 November 1993.’ This division appears to have been replaced within 3rd Corps by the 52nd Armoured Division, formed later on. The Military Balance, 1994–1995 also lists the following units: the Presidential Guard Regiment, an infantry regiment, five border defense regiments (Brigades (? )), and twenty-six border defense battalions. The fate of these independent units under the reorganization remains unclear. In late 2002 the 3rd Corps, with its headquarters near Istanbul, was certified as one of the six NATO High Readiness Force-Land (HRF-L) headquarters and gained the additional title of the Rapidly Deployable Turkish Corps (RDTC). A year later, Jane's Defence Weekly reported on 9 July 2003 that as part of force restructuring, its four existing armies would be reorganized into a Western Army, in Istanbul, and the Eastern Army would replace 2nd Army in Malatya. This plan does not appear to have been carried out. 39th Infantry Division – headquartered at Camlibel within the district of Girne. 14th Armoured Brigade – also in Asha (Paşaköy) with M48 Patton tanks. Turkish Land Forces has NATO-compatible rank system. ^ a b Harp Akademileri Komutanlığı, Harp Akademilerinin 120 Yılı, İstanbul, 1968, p. 53. ^ a b "TSK Mevcut Personel Sayısını açıkladı". Turkish Armed Forces. Aktif Haber. Archived from the original on 6 October 2014. Retrieved 2 October 2014. ^ "Kara Kuvvetlerinin 600. kuruluş yılı kutlandı". Milliyet (in Turkish). Istanbul. 29 June 1963. Retrieved 21 March 2015. ^ Turkey, Office of the Prime Minister, Directorate General of Press and Information, 1993, p. 23. ^ Andrew Mango, Turkey: Nations and Peoples Library New Nations and Peoples, Walker, 1968, p. 45. ^ Turkish Armoured Forces. See also http://tankfront.ru/neutral/turkey/turkey.html. ^ Savvas Vlassis, "O Aporritos Attilas", Doureios Ippos (2004). ^ Intercommunal Violence and Eric Solsten, ed. Cyprus: A Country Study. Washington: GPO for the Library of Congress, 1991. ^ Source Turkish Wikipedia, Kemalettin Ekin. ^ John Keegan & Andrew Wheatcroft, Zones of Conflict: An Atlas of Future Wars, Jonathan Cape, p.20-21. ^ This readiness scheme reflects outdated Western concepts. See Michael Holm, The Soviet Readiness System for a contemporary, more nuanced assessment. ^ "NATO wants say in Turkey-China missile deal". ^ "Force Structure". Archived from the original on 2007-10-11. Retrieved 2007-10-09. ^ Unification of Culture and Tourism Ministries constitutional One soldier killed, three injured in terrorist attack Minister Cicek says Turkey's credit, Turkish Daily News, October 17, 2003. ^ "Turkish Army". Ole Nikolajsen. Retrieved January 17, 2009.